This spacious, modern, and totally remodeled vacation home is now available for your next Palm Springs adventure. Conveniently located to all that Palm Springs has to offer, Sunsplash is a quick 3 minute drive to the famous Downtown Palm Springs, and all major tourist attractions. This spacious 3 bedroom - 2 bathroom vacation home boosting 1,700 sq. ft. of indoor living-space, is perfect for those who enjoy entertaining friends and family. The large backyard features gorgeous mountain views, outdoor seating areas, outdoor dining, billiards table, a gas BBQ and sparkling swimming pool with a spa. 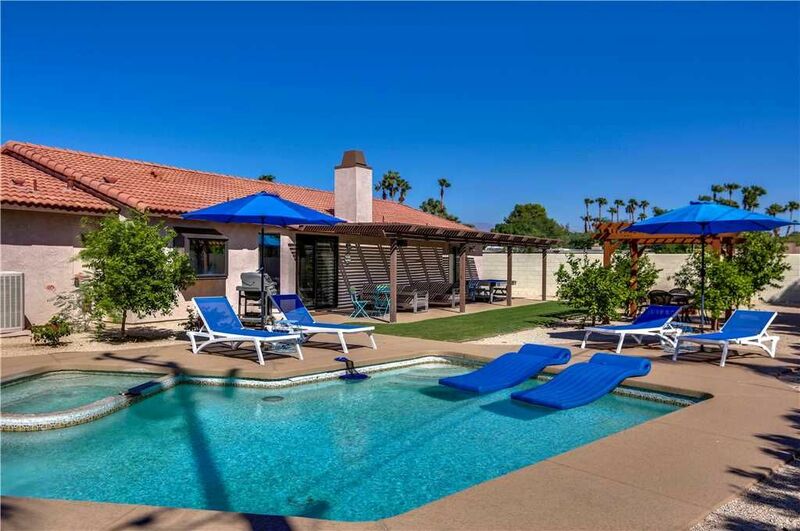 Your friends and family will sure enjoy the outdoor oasis of this Palm Springs vacation rental. Come escape to Sunsplash and soak up the year round California sunshine. Sunsplash vacation home is light and bright, showcasing the open floor plan with beautiful tile flooring through-out. Modern decor and stylish contemporary home furnishings set the mood for a perfect Palm Springs vacation. The living room has a beautiful stacked-stone fireplace, where you can cozy up for the evening, watching your favorite TV shows on the comfortable couches. Just chill out with your friends in the comfort of your own living room with a built in bar. A chilled drink never sounded so good. The kitchen is completely upgraded and remodeled in 2017. All new stainless steel appliances; with new granite counter tops, new cabinets and plenty of storage spaces for you to store all your food and beverages. This is a spacious gourmet kitchen perfect for the chef in the group, who enjoys making great dinners for friends and family. The formal dining room is located directly across from the kitchen, a great place to hold a nice holiday dinner. The large en-suite master bedroom is airy and open. A comfortable king size bed with fine linen is sure to provide a good nights rest! The master bathroom is completely remodeled and upgraded just like a 5 star luxury hotel spa. Dual sinks and a large marble walk in shower are sure to make you feel like a movie star! You also have direct access to the fabulous backyard! The two addition guest bedrooms are down the hall, both are queen size beds with comfortable linens and both tastefully decorated. An upgraded Jack and Jill bathroom is just right down the hall. A convenience laundry facility is on the other side of the hallway, doing laundry is easy and private! Palm Springs is all about sunshine, backyards, mountain views and the POOL! Sunsplash is the perfect place for a true Palm Springs experience. The large backyard features a nice fire pit so that everyone can cozy up on those chilly nights. Enjoy the outdoor dining area with a BBQ grill for that afternoon, fun in the sun day. There are plenty of lounge chairs to lie around and soak up the sun or just read a book by the pool. Come and enjoy Sunsplash - An ultimate Palm Springs getaway! Modern and sophisticated, this home is a great choice for those who enjoy the indoor/outdoor living Palm Springs is known for.Pool heat is added upon request at an additional charge. Fun in the Sun(splash)! Sunsplash is a beautiful home with nice amenities such as the masterbathroom and a large, open living room & dining room area. Sunsplash Stay The place was designed really well and was very clean. Sunsplash was a hit The home was very clean and comfortable, and the back yard was large and private. Furnishings and linens were more than adequate, even plentiful.